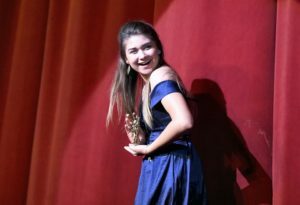 The Syracuse High School Theater Awards were held on Sunday, June 3rd, at the Landmark Theater. Congratulations to Allison Vargo (10th grade) who won the Rising Star Award! The Faith Heritage production of Fiddler on the Roof was nominated for Best Show in the small school category. This is our school’s first nomination for best production. Also nominated, was Peyton Anderson (12th grade) for Best Actress in a Leading Role.